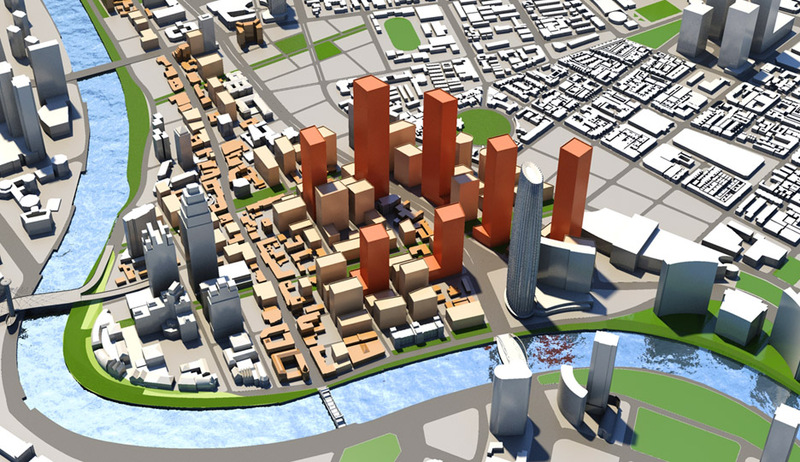 The planned Tianjin Financial Center mixed-use development is located in the center of historic Tianjin on the banks of the Haihe River, and covers approximately 220 hectares (300 acres): approximately 1,800 meters in the north-south direction and 300 to 700 meters in the eastwest direction. TFC is located in a very constrained location, with the Haihe River on the north and east sides and an old town with a fragmented street grid system on the south and west sides. At the heart of the site is the historic Jie Fang Bei Road, which will be transformed into the social center of downtown. CHS Consulting Group worked with SOM in the development of a conceptual land use, urban design, and transportation plan for the District. CHS developed a concept plan that includes additional mass transit lines and stops to serve the core, potential for a BRT system on the arterial road on the western edge, a one-way grid street system within the core of the project area that would serve internal circulation needs, and an arterial roadway system that would connect to the regional freeway network.